I am home now in New Hampshire. I realize I have missed my favorite season here, when the air gets crisp and cold, and trees put on their fiery display. 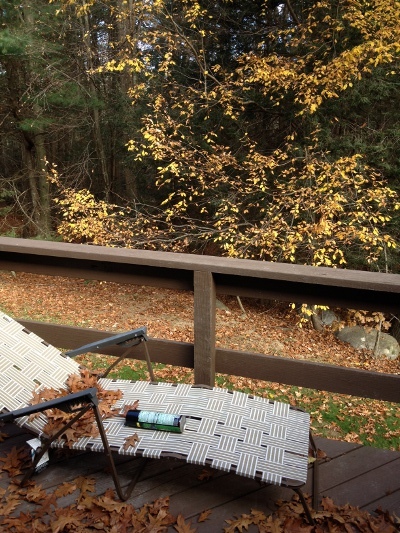 The view off my deck is of October gone, and winter coming on. My deck. Note the unnecessary wasp spray in the lounge chair. At 28 degrees this morning, wasps are fast asleep somewhere else. 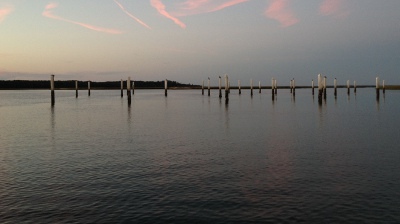 Once we made the decision to make it to St. Augustine, we felt better about the whole trip. We would end up where we wanted to be, and there was no stopping us. 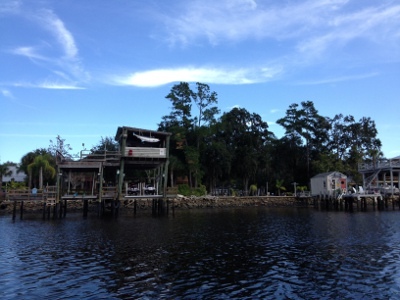 We arrived in Brunswick, GA after two nights at anchor and checked into Hidden Harbor Marina, managed by friends of Phil’s. The next morning, we were off at 8am to start two marathon days that would bring us to Florida by Halloween night. We stopped for fuel at Jekyll Island. As we were filling up, Phil cracked a joke and the dock attendant promptly dropped his iPhone into the water. “Dang it,” he said. “That’s the third one I’ve dropped here.” The dock hand told us we had just traversed the dangerously low passage into Jekyll Island at the most risky time, low and falling tide. We had gone slowly, picking our way through the shallow channel but never touching bottom. Others would have waited for higher water, but our 4.5-foot draft hasn’t slowed us down at all (well, except for the one night on the mud flats of Rock Creek). Phil took my picture, in my usual docking position on the bow, handling the bow line. During fueling, I wait on the bow to handle the bow line. My job is to get the line from the dock hand, take it off the cleat, wrap it neatly and make my way back to the cockpit, picking up the fenders as I go. We crossed St. Andrew Sound and into the Cumberland River. We crossed the state line into Florida before noon, and motored past the last of the deserted creeks into more populous areas. On Wednesday night, we anchored at the Amelia River and were attacked without mercy by swarms of little gnats – “No see-ems” that left us itchy and drove us inside. Phil put a mesh screen on the forward hatch. We left early the next day, knowing it would be a 10-hour day that would bring us to St. Augustine. It would be the last cruising day of our trip. I took the helm on the Guana River, which was narrow but not terribly shallow. The homes were getting larger and more beautiful by the mile. Soon we were passing mansions served by private, two-story docks with spiral staircases. 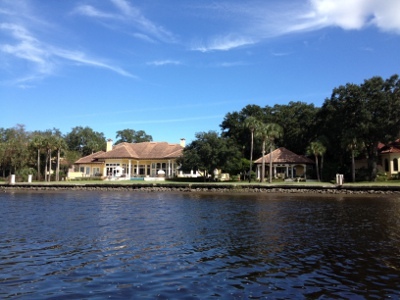 Along the Guana River, the large houses were beautifully landscaped, and even the docks showed a level of affluence we hadn’t seen farther north. A two-story dock adorned with a large fish. The docks and piers were getting more elaborate. The mystery oil made the engine run a little better, and we kept on. We had to slow down to keep the engine happy, and I let Phil drive so he could monitor the ailing motor. I kept thinking, don’t quit now! We are so close! We spotted St. Augustine light after crossing under the Vilano Beach Bridge and crossed the St. Augustine inlet. I called the Bridge of Lions, so afraid I would slip up and call it by our nickname, the Bridge of Loins. It opened and we motored into our new home in slip 67 of the Municipal Marina. On the dock, there was a Cruisers’ Happy Hour. After tying up, we walked over to the party with our box of wine. We were welcomed like old friends, and met some new friends. One of the cruisers said, “St. Aug gives you a big hug when you arrive here.” We felt as if we had arrived at our home. The view from our new home. 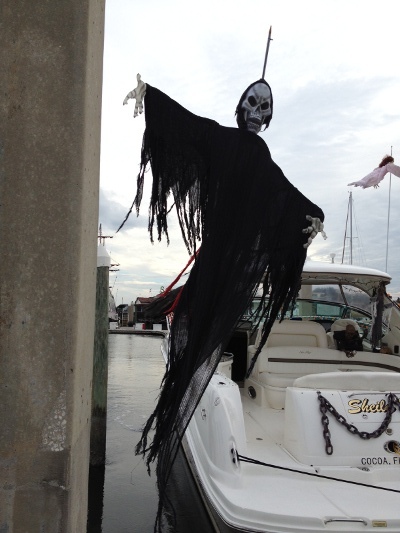 It was Halloween, and several boats had decorated for the occasion. 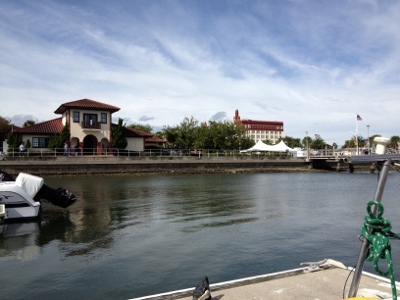 St. Augustine is a wonderful town, the oldest in the country. It is steeped in history. 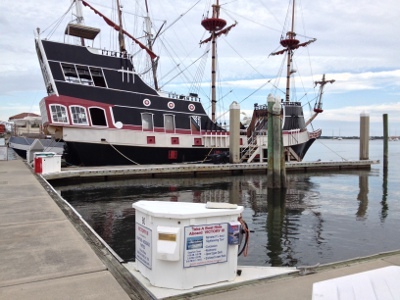 On our dock is a pirate ship, the Black Raven, and pirates walk by us on the pier, sporting tri-corner hats and long curved swords. It’s not because it’s Halloween. They dress like this all the time. The Black Raven, crewed by pirates. We played the part of tourists for the next two days, visiting the St. Augustine light and taking the Red Train tour around town. We climbed to the top of the light, all 219 steps. Here is Phil at the top. 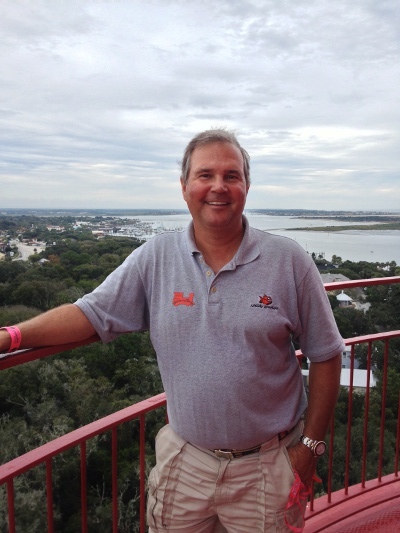 My captain, at the top of St. Augustine Light. I had rented a car to drive to Savannah on Sunday, so I could catch a plane to another plane to a bus to home. It would be an ordeal, but I travel well and don’t mind. We had one last night at Maria’s on the waterfront, where we fed the catfish and watched a giant Great Blue Heron on the nearby marker. I didn’t want to think about leaving the next day. I wanted to stay. 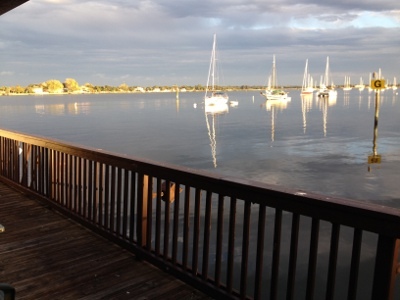 Our sunset view of boats on their moorings. There was a rainbow in the sky as we watched the sun descend. The next day, Phil got up with me at 5:30 and walked me to the rental car. We kissed goodbye and I drove away. I’ll be back one day, but I don’t know when. I’ve been there, in my thoughts, ever since. This is not the last blog, just the last one for a while. I blinked back a few tears on my way to Savannah, but Phil didn’t see them. Now, I am home, sitting at my dining room table. In spite of two purring cats by my feet, it is lonely here. 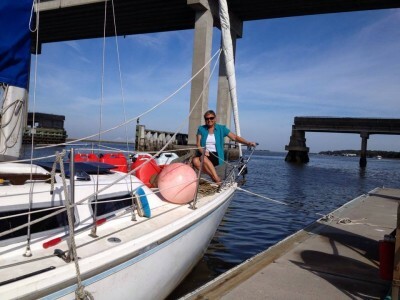 For five weeks, I lived on a 27-foot sailboat with a wonderful man. We traveled 900 miles in 33 days. Catmandu was my home, for a brief, special time. Home is where the heart is. I left mine in St. Augustine. 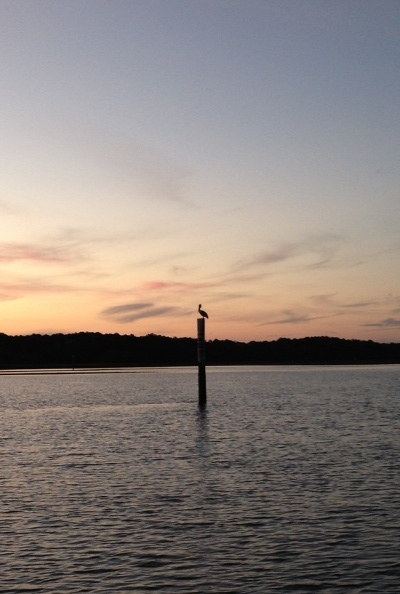 Lone pelican on a piling at sunset. Our days in Georgia are spent motoring through winding creeks, watching the depth. Phil is singing Country Western songs: “Shoaling, shoaling, shoaling (Rawhide)” and “Back in the Channel Again.” The weather has finally turned warmer and we have sun every day. Our first stop after our night aground is Skull Creek Marina, where we share the dock with big awkward pelicans and one Great Blue Heron who wasn’t afraid to perch about six feet away in the dusk. Birds perched, one to a piling, at Skull Creek Marina. 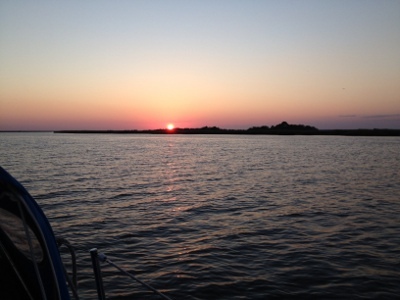 Queen Bess Creek is our anchorage for the following evening, and presents us with an incredible sunset. We sit in the cockpit watching the sun go down. 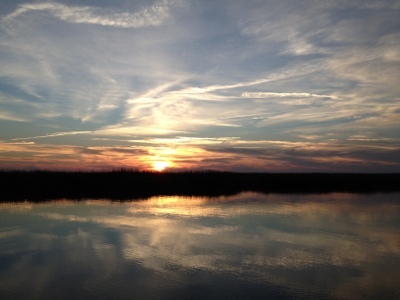 A watercolor sunset, Queen Bess Creek, Georgia. We have less than a week left of our time together, and only two days until we get to our agreed-upon stopping place, Brunswick, GA. The wheels start to turn. Then the wheels come off of Plan C, and suddenly Plan B is a possibility. We will be in Brunswick on Tuesday. We can be in St. Augustine by Thursday night. Phil’s face lights up. “We can do it!” He is so excited, I can’t bear to remind him that I just bought a non-refundable ticket home from Savannah. I’ll worry about that later. We are happy. The next day, a dolphin breaches right off our port bow and lingers alongside us. It’s a good omen. We pull into our anchorage at Queens Island, in view of the red and white striped Sapelo Island Lighthouse. Dolphins are swimming around the mouth of the creek, and Phil catches a fin in a photo. Finally, some evidence. And another sunset to remember. Sunset from our anchorage at Queen’s Island, Georgia. Here, we had night visitors. The night is warm and clear. Since there’s no moon, the stars are brilliant and the Milky Way is visible above us. Phil lies on his back in the cockpit looking for shooting stars, but my attention is drawn to the water. I hear soft rippling sounds, as if someone is dangling her feet in the water. I peer into the dark ripples, but can’t see anything. Then, from just a few feet away, I hear a loud huff. It scares me; it is strangely human, as if someone is letting out an exasperated sigh. “What is that?” I whisper. We are quiet for a while, listening. Another huff, farther off, breaks the silence. “Dolphins breathing!” Phil whispers, and we hear another one. They are all around us in the dark water, and as I scan the surface, I see a reflection of our cockpit lantern in a round circle. An eye. They are watching us, too. Like so many moments of this adventure I’m on, this is an experience I will never forget. We sit for a long time under the stars, listening to the breathing of dolphins.